Artwork Panel: 31.5cm x 101.5cm ≈ 12½" x 40"
Silk/Brocade: 40.8cm x 157.9cm ≈ 16" x 62¼"
out even the finest detail. A gorgeous painting featuring lotus flowers and a kingfisher bird flying above. This is the last of the kind, as the artist has retired a couple years ago. I was keeping this one for myself, but I am out of wall space, so I am releasing it for sale. The artist's title for this piece is "He Tang Cui Yu"
Together, "jade feather" refers to the beautiful green color of nature. I got a chance to visit the artist's studio in Jinan city recently. I am so impressed by her style and detail in all of the paintings in her collection. I bought as much of her work as I could possibly afford, and I am sure that I will be back for more in a few months. I also discovered that because she more than a little famous in China, there are a lot of forgeries on the market. I was given a lesson on how to spot forged paintings that are signed with her name. 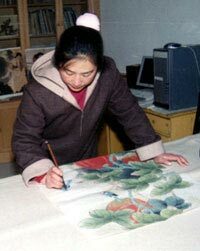 Of course, the best way to avoid that is to get your work directly from the artist and her family, which is why I made the trip to Jinan in the first place. 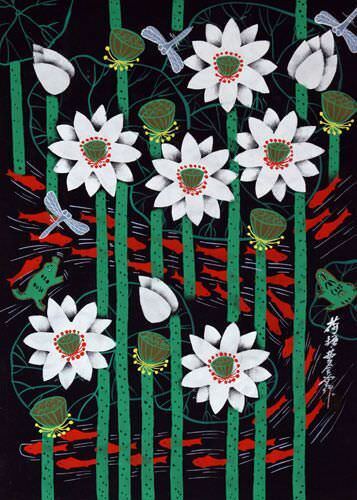 The artist, Qin Xia lives in Jinan which is the capital city of Shandong Province in northern China. The red stamp and the Chinese characters close to the stamp say "Qin Xia" (the artist's signature). The other Chinese characters express the title and year painted (2008) in an ancient method that uses certain Chinese characters instead of numbers to represent the current year. This is an "elaborate style painting" which has a lot of detail and uses a delicate technique with a very fine brush. Each stroke is meticulously applied. This technique takes a long time for the artist to complete. 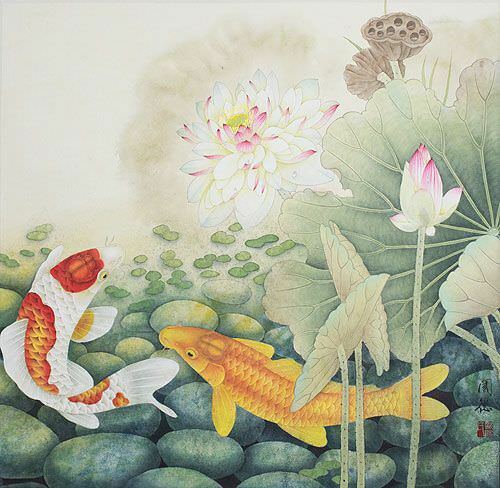 This is painted on special xuan paper (known by most as "rice paper") with Chinese black ink and watercolors. 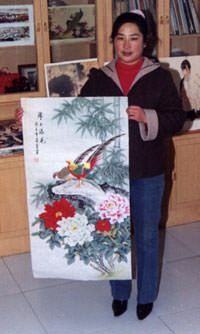 Later, I took this painting to Beijing where our master-scroll-maker handbuilt a wonderful silk scroll for this artwork.